Writing this review made me realize how much a hypocrite we all can be. I say this because I can't imagine how many times I've thought or said something to the effect of "I miss games like Final Fight and Streets of Rage. They sure don't make side-scrolling beat-em-ups like they used to." Yeah, I've said stuff like that. I'm sure many of you have as well. 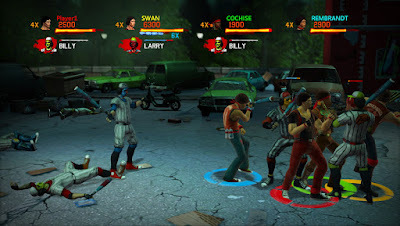 Then came along The Warriors: Street Brawl and I was proven wrong on two accounts. Not only do they make them like they used to, I also shouldn't be playing them like I used to. The Warrors: SB is a strange beast. Right away you know you are playing a game based on the cult classic film from 1979, but you also realize something is missing. All the gangs are represented somehow, so it isn't that. The opening logo of the game is accompanied by "Can you dig it?!" being yelled in the background, so you feel that nostalgia right away. Strangely enough, that instance and a little bit of "Warrirors, come out to play-ay!" seem to be the only voice acting or dialog that carried over from the film. A little bit of the original score came over with it too, but not much. What is missing is the feel of this being an official Warriors product, thanks to a fairly low level of production values. We might all be spoiled by the previous Warriors game put out by Rockstar a few years back, but they had to know this going into it. I understand that this is a $9.99 game, and thus something had to give, but when the game's control scheme, move set and combo system feel as old as the movie the game was based on, we have a problem. Thankfully, there is a fairly meaty package for the price. The controls don't do anything to improve on an old formula and stiff character animations only accentuate that. The multiplayer modes help to add more value to the package, but when so many characters look similar on the screen at the same time it can become very frustrating. Really, all the things you didn't like about side-scrolling mashers in 1989 still apply in 2009. If the comic-book style cut scenes had the film's audio, or any of a number of things they could have done to ramp up the presentation of the game, I would be way more forgiving. You need to sell me the world of the license in a licensed game, no matter how big or small it is supposed to be. 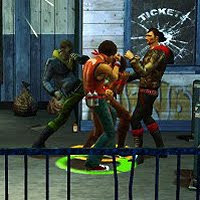 Unfortunately, with such a memorable property, The Warriors: Street Brawl comes across very generic. If you've got a 10-spot burning a hole in your pocket, and you absolutely need some familiar four-player button mashing to pass the time, you could do a whole lot worse. If you wanted this game because you are a fan of the film you could also do a lot better. I'm not sure if there were licensing problems or time restrictions, but they really could have layered in quite a few things to make this a more Cochesive experience. See what I did there?